Aberdeen has been the most prolific of Scottish cities in providing SAAA Marathon champions – I include Aberdonians running for other clubs as Aberdonians. Colin Youngson, Alastair Wood, Sandy Keith, Graham Laing, Fraser Clyne and Peter Wilson were all worthy winners and in 1984 he joined the happy band. In some ways it was harder for guys like George and Peter Wilson because they were not accorded the – at times excessive – respect that others received and so the races were maybe that wee bit harder. Colin Youngson pays this tribute the SAAA Marathon Champion George Reynolds. George, originally from Kinloch Rannoch, was for some time based at RAF Kinloss, near Forres in Moray. His career highlights included beinng part of the record-breaking Aberdeen AAC team in the 1982 John o’Groats to Land’s End ten-man relay and winning the 1984 Scottish Marathon Championship. George represented Elgin when running the 1980 Aberdeen Marathon in 2:36:42. By 1982, George Reynolds was 21 years old and was winning North District Cross-Country League races. He joined Aberdeen AAC in time to take part in the JOGLE in April of that year. Although George was the youngest participant, this tall, strong runner played a vital part in his team’s success which is documented elsewhere on this website. This triumph was celebrated in style at a Civic Reception in the formal splendour of the City of Aberdeen Town House. Not long after this, George Reynolds moved south to Lincolnshire where he worked as an aircraft technician. He recorded a fine personal best of 2:20:40 when in the 1983 London Marathon, and subsequently trained heavily for London in 1984, after finishing twelfth in the tough RAF Cross-Country Championships. For twelve weeks (four weeks build up, four weeks intense, four weeks taper down) he ran as many as 125 miles in a week including a three hour Sunday run. However this recipe did not produce the desired result, since after a fast start he slowed especially in the last three miles to 2:28. Like many others he had learned that more does not necessarily mean better. Consequently he altered his plans for the Aberdeen Marathon, which included the 1984 Scottish Marathon Championship. After showing impressive stamina with a good third place in the seven-day Tour of Tameside, he started a nine week regime (three weeks build up, three intense, three taper). In total contrast to his pre-London system, he decided to reduce the weekly mileage to 75 – 80 and concentrated on speedwork. Sunday runs (24 miles) might be on his own or with friends from Grimsby Harriers. The reduced mileage gave him a feeling of speed in the legs, even after a long run. Unfortunately, since the base was preparing for a big flying service in Cyprus, he had to work 12-hour shifts around the clock, and became physically and psychologically low. This ended in the most pleasant way when just before Aberdeen, the SAAA eventually got around to inviting him to represent Scotland in the Home Countries international versus teams from England, Ireland and Northern Ireland. George was delighted and revived immediately. The night before the race George tried out his splendid new Scotland strip and tracksuit and checked his faithful Asics Tiger Jayhawk racing shoes for comfort. He slept well despite constantly thinking about the race next day. He remembers nervous chatting to rivals before the Sunday morning event, and the unusual weather in Aberdeen – no wind, sunny and warm. At seven iles, going up a near deserted Union Street he enjoyed a solitary piper blowing tuneful encouragement to the Scots in particular. There was to be a piper at every single mile marker on the route! It was a surge by Charlie Haskett (Dundee Hawkhill Harriers) after fifteen miles which began to split the group. However on the South Deeside Road at twenty miles, George and Charlie heard the fateful patter of large English feet as Mark Burnhope loomed alongside and before long moved away to victory in a time of 2:19:36. George was left, isolated and vulnerable, to survive the final miles, gradually tiring and worrying about losing second place. He only looked over his shoulder in the home straight and didn’t spot the sprinting English runner Alan Catley and was relieved to hold his place (2:21:04, five seconds in front of Catley. George’s mother, brother Alick and girlfriend Ingrid rushed over to congratulate him. It was an extra pleasure to realise that he had won the SAAA Marathon gold medal. Silver medallist was Charlie Haskett (fourth in the International race in 2:21:37) and bronze went to Colin Youngson (sixth overall in 2:23:36) behind England’s Colin Brown (2:22:37). Just one week later, George Reynolds ran the Humber Marathon from Hull to Grimsby and amazingly won the event in 2:22:38, winning a trip to the New York City Marathon! By 1985 George Reynolds, having moved back to Kinloss, had switched clubs to Elgin AAC, as well as the RAF, and ran 2:22:31 in the London Marathon. No slouch at shorter distances on the road he ran the 1986 Aberdeen Half Marathon in 66:53. 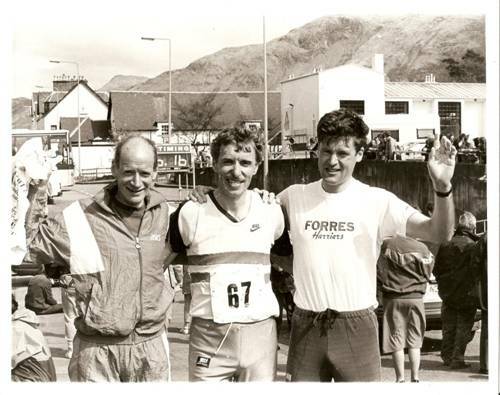 Later he joined Donald Ritchie in Forres Harriers and despite training less hard, finished second in the 1992 Lochaber Marathon. George eventually gave up competition in 1994, but for some years kept running twenty miles a week and seeing old friends or foes at Highland Games – as an expert on the bagpipes. The profile indicates that George was a worthy winner of the championship and it is maybe unfortunate that he seems to have given the sport up completely at what was a comparatively young age.